Like global temperatures, WA temperatures have also increased since 1910. 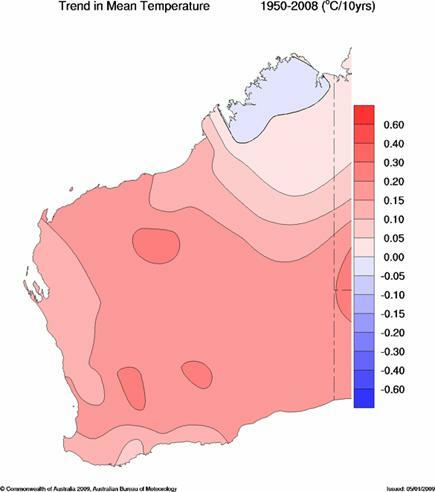 The strongest trend has been observed since the 1950s (Figure 2), though in the far north of WA there has been a slight cooling in average temperatures. Across the state as a whole, mean annual temperatures have increased since 1910 by approximately 0.8ºC. In southwest WA, a drying trend has been observed (Figure 3). 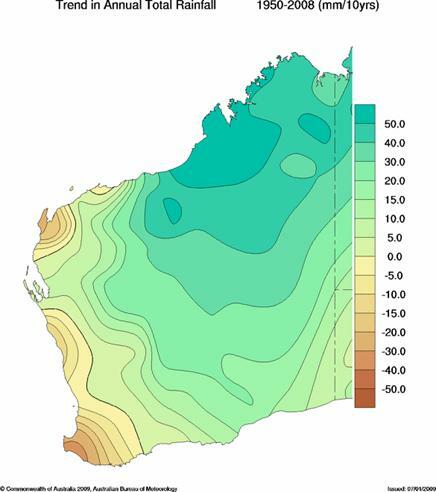 The rainfall decline has been most apparent in late autumn and early winter, with a major drop in rainfall totals occurring in the 1970s, and possibly another more recently in the 1990s.Â Averaged across southwest WA, a step decrease in total annual rainfall of almost 10% was seen in the mid-1970s, though individual locations would have experienced a greater decrease. For more information on observed changes in WA's and Australia's climate, go to the Bureau of Meteorology's Climate website. IOCI Stage 3 is currently building on past knowledge to improve our understanding of what causes changes to rainfall over south-west and north-west WA.